Swansea Drydocks commits to the prevention of pollution and the compliance with all relevant environmental legislation and other applicable requirements. This policy statement is communicated to all employees, suppliers and sub-contractors and is available to interested parties. Article 4 of the revised EU Waste Framework Directive (Directive 2008/98/EC) sets out five steps for dealing with waste, ranked according to environmental impact – the ‘waste hierarchy’. See diagram above. SDL acknowledges that when undertaking all of our operations on site, prevention (which offers the best outcomes for the environment) is at the top of the priority order, followed by preparing for re-use, recycling, other recovery and disposal, in descending order of environmental preference. 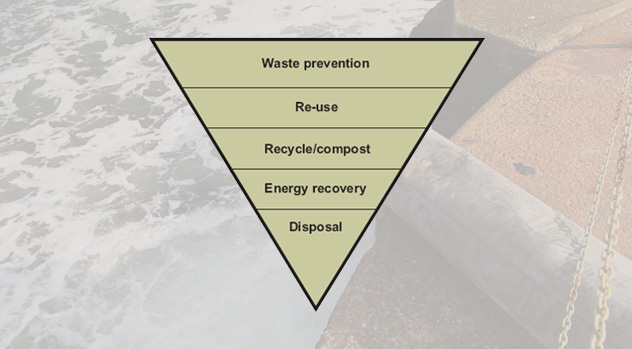 SDL’s Environmental Policy and operational procedures follow the principals of this waste hierarchy approach.